Julia Reda – People are taking to the streets on August 26th to #SaveYourInternet – join in! People are taking to the streets on August 26th to #SaveYourInternet – join in! 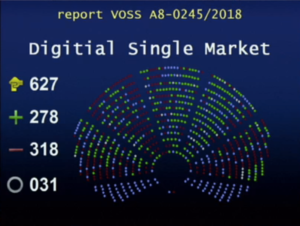 A month ago, we made history: We stopped a law that would have massively restricted our freedom of expression in its tracks, dealing powerful lobbies an “unprecedented defeat”. Thank you for helping make that happen! We’ve stopped the train – but the job is not finished: Now we must put it on the right track. On September 12th, MEPs will vote on how to proceed with the Copyright Directive. Proposals can be filed until September 5th. Our goal is clear: The Parliament must adopt alternatives for Article 11 and Article 13 that don’t force platforms to install upload filters and don’t threaten links and snippets with an extra layer of copyright. We should also reverse other bad decisions by the Legal Affairs Committee: By one single vote, the Committee decided not to demand a copyright exception for user-generated content (like remixes, lip dubs or fan fiction) and declined to clarify that linking is not copyright infringement. Instead, it called for granting copyright protection to sport event organizers, which would make it copyright infringement for fans to post their own snapshots of matches (Amendment 76). It also proposed that image search engines should be required to take out expensive licenses to allow us to find images on the web (Amendment 79). I’ll be working towards these goals in the Parliament with our allies. Meanwhile, people all over Europe will be lending support from the outside. They’re claiming the protest was all fake, generated by bots and orchestrated by big internet companies. According to them, Europeans don’t actually care about their freedom of expression. We don’t actually care about EU lawmaking enough to make our voices heard. We will just stand idly by as our internet is restricted to serve corporate interests. We’re 1 million standing strong to #SaveYourInternet from censorship & control!Tweet this! Join in on Sunday, August 26th in a city near you. Various groups (local parties, alliances and individuals) are putting together events all over Europe. Check saveyourinternet.today to find an event near you! If you’re able to organise or know of a protest in your city, drop my team a line and we’ll add it to the map. Don’t forget to reach out to local politicians and parties who voted against the plans, as well as the local media! I’ll be sharing the exact times and locations of the protests on Facebook and Twitter as I hear of them. I’ll be at the protest in Berlin — and you? Great Idea. I‘ll call as many friends as I can to come with me! Nothing in Brussels. That’s odd. Why not?